Good swag? What is it? What are your favourite swaggy items? But what makes good swag? Usability. A pen is usable, however it’s an easy piece of swag for vendors and conference organisers to give out. How many conference pens have you got? How many are still capable of writing anything? I filled an A4 paper box with conference pens gathered over the last 10 years: none of them worked without a lot of effort. Granted pens are excellent if you need people to fill in feedback forms – having a pile of pens handy encourages folks to complete the form as they don’t have to hunt for a pen of their own. USB pen/key drives are usable, however only if they are “right sized”: 512MB is no good these days…unless it’s simply a CD replacement (devExpress gave out 512mb drives at one of the TechSummits, it contained up-to-the-minute builds of CodeRush and RefactorPro – this is when a 512MB drive is considered good swag!) For key drives, 4GB used to be an expensive option, however nowadays, 8GB and even 16GB should be deemed reachable. Fun. Swag has to have a reason for being, be it useful or fun. Wrox lollypops are fun, as can be seen here. Practical. Practical and usable are very closely related, however there is a fine line. Practical to me, means it’s not “throw away” type swag. Usable means that I might not use it daily, but I will put it somewhere that I can use it. Socks and wearables that aren’t garish are practical. For example, I have a few pairs of thick Microsoft/MSDN socks – these are practical. Branded clothing is also practical, although some folks prefer the branding to be “delicate”…I personally don’t mind branding being “in your face”. If you are thinking about producing wearables, assess your audience: how many XXL t-shirts do you see at conferences? Too many IMHO. 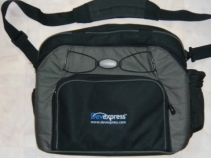 DevExpress laptop bag. Laptop bags are emotive items. This one is perfect for 17″ laptops, whilst still providing space for other toys and chargers (when I remember to pack it!) It also has two stretchy bits at either end – ideal for a small umbrella (I live in Scotland, sometimes the rain is so heavy that a small umbrella is required) and a soft drink of some kind too. Microsoft SharePoint thermal mug. I use this virtually every day. It’s perfect. It fits in my car’s cup holder. It works – hot drinks stay really hot for well over an hour. It doesn’t spill. I’m sure that I blagged this from @lliu during a Microsoft MVP Summit. Office duffel bag. I have two of these. They are great for carrying camera equipment at events as well as being an excellent golf shoe bag! 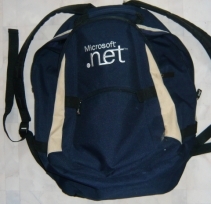 I also find myself using a Microsoft .NET rucksack that was given out at MSDN Roadshows around 2000-2001. It’s almost usable as a laptop bag, but since it has little in the way of padding, care is required. Nonetheless, it’s “right sized”, not too big and not too small. That’s not to say that the CodeZone fleece, the Microsoft MVP rugby shirt and dress shirts aren’t good swag – they are used very frequently too. Good wearables, IMHO, make good swag, especially if the vendor goes out of their way to ask you what size you are! Stuff that is hard to get rid off. If swag doesn’t fall into the usable or practical, folks may reject it. Conference organisers like to give swag away…they’re not so keen to take it back! Personally, I try to recover and re-use as much swag as I can: cleaners don’t want swag, they’ll simply “bin it”. It’s important to recover such swag: vendors paid for it and gave it to the conference, recovery is key. Besides, it’s only common decency to grab a box and run around the conference rooms cleaning up after you, yes? Breaks easily. Good swag can be delicate swag, i.e. it breaks very easily. If that happens, word gets around and you have bad swag! Doesn’t work. Swag that looks to be useful and practical needs to work. I’ve seen a lot of USB gizmos that were very appealing, however they simply didn’t work when plugged in. Good, but legacy. Think about USB devices. 1.1 is old hat now, don’t expect your audience to like you if you give them a 1.1 device that relies on a little bit of speed! Folks won’t thank you for a USB 1.1 pen drive these days! What makes good swag? What are your favourite items of swag? Please do share in the comments!